There may be traffic delays on Columbian Way South today near the intersection with South Spokane Street where Seattle Department of Transportation crews will be repairing the roadway. One northbound lane will be closed on Columbian Way on each side of Spokane Street, and one westbound lane will be closed on South Spokane Street approaching Columbian Way. The sidewalks will remain open, and a police officer will assist traffic. The closures are expected to be in effect from 8 a.m. to 6 p.m. today. Today, the Seattle Department of Transportation (SDOT) will close the right lane southbound on the Dr. Jose Rizal Bridge to conduct a routine inspection of the bridge. The closure will begin at 9:00 am with the lane reopening for traffic no later than 2:30 pm. The western sidewalk adjacent to the closed lane will remain open. One lane will be closed on this bridge today so this nearly 100 year old bridge can undergo an inspection. Photo by Bridget Christian in the Beacon Hill Blog photo pool. Sound Transit is continuing subsurface void remediation work near Beacon Hill Station, including drilling within the right of way on South Lander Street. For about a month, Lander will be closed between 17th and 18th Avenues South, with a one-block detour to either South Waite Street or South McClellan Street. There will be flaggers to assist drivers. The work will be done between 7:00 am to 7:00 pm Monday through Friday, and there will be heavy equipment and support vehicles operating in the area during these times. The street will remain closed overnight and potentially over weekends. Drilling will also continue to take place on private properties on 17th (if you haven’t already been contacted by Sound Transit, your property isn’t included). If you have any questions or concerns about the project, contact Jennifer Lemus, Sound Transit Community Outreach, at 206-398-5314 (work), 206-423-1407 (cell), or at Jennifer.Lemus@soundtransit.org. On Tuesday, May 25, Sound Transit’s contractor, Obayashi Corporation, will close 25th Avenue South between South McClellan Street and South Hanford Street for final paving work. The closure is temporary and will be in place between 7:00 am and 5:00 pm. No detour is necessary; local access will be granted at all times, and signage and flaggers will be on-site to help drivers through the work zone. If you have any construction-related concerns, please call the construction hotline at 1-888-298-2395. The work zone is marked in red. See a larger map. 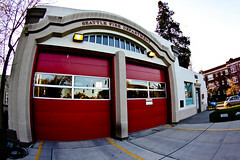 Fire Station #13 named a historic landmark by the Seattle City Council. Photo by Bridget Christian. Fire Station #13 at Beacon and Spokane Street is one of ten new historic landmarks named by the Seattle City Council. There are currently three open spots for the May 15 tamale-making class at El Centro. The class is $50 and you get to take home some delicious work along with your newfound skill and knowledge. Contact Ashley Haugen at 206-957-4611 or e-mail development@elcentrodelaraza.org for more information or to sign up. Proceeds benefit El Centro’s senior programs.Thanks, Elliott! The Seattle Department of Transportation continues to work on the West Seattle viaduct construction project, as well as other construction and changes in the Sodo area and the overpasses from Beacon Hill to Sodo. Particularly of note: the First Avenue South on-ramp to the West Seattle Bridge will close permanently on May 17, and there will be lane closures on the Holgate Street overpass on May 17-18, and on the Columbian Way overpass on May 19-20. See the latest planned construction notices here. The Seattle Public Library wants to know what you think about library services and priorities. Help plan our local library’s future by filling out their survey — it’s available through May 16. The Jun Hong Kung Fu and Sports Association is sponsoring a Beacon Hill Health Walk as a fundraiser for China earthquake relief on Saturday May 22, from 9:00 am to 12:00 noon. The starting location is 4878 Beacon Avenue South, and the walk is three miles, with a turnaround/water break at Van Asselt Community Center. There will be a team flag competition, and t-shirts for adult registrants. Registration forms are available at Jun Hong Kung Fu and Sports Association, 4878 Beacon Avenue South, or you can find an online registration form here. Registration is $10/adults, $5/kids, and the registration deadline is May 21. For more information, contact Dee Williams at debwilli2003@yahoo.com or Jeffrey Chon at jchon1234@live.com. Pat McGannon is organizing a neighborhood clean-up to collect litter from the streets and public stairs. Gloves, grabber tools, orange safety vests, and garbage bags will be provided to make litter collection safer. 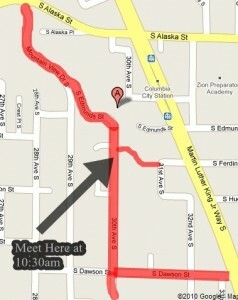 Volunteers should meet at the top of the South Ferdinand stairs (on 30th Avenue South) at 10:30 am. For more information, please contact Pat at pmcgannonmail-cleanup@yahoo.com. 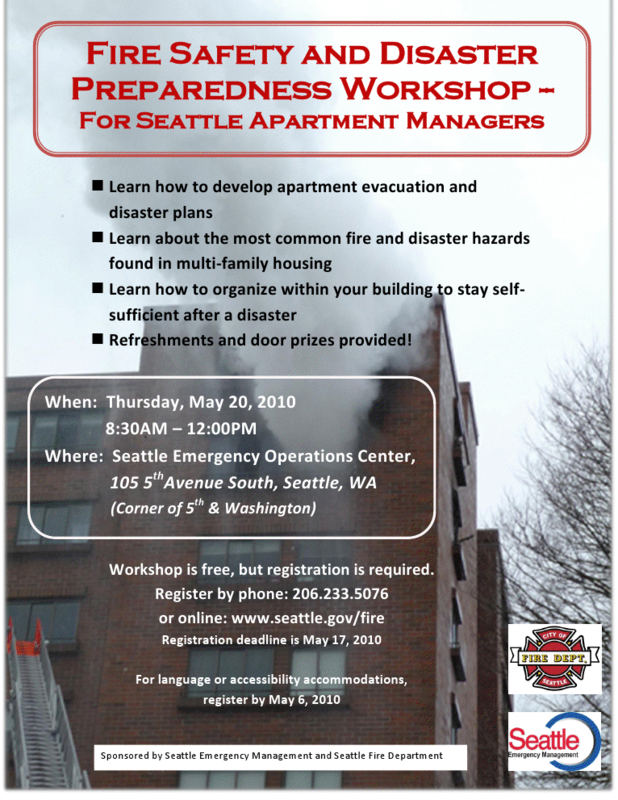 Host families for exchange students are needed in the Puget Sound area, and there is a Fire Safety and Disaster Preparedness Workshop for Seattle apartment managers scheduled for May 20. 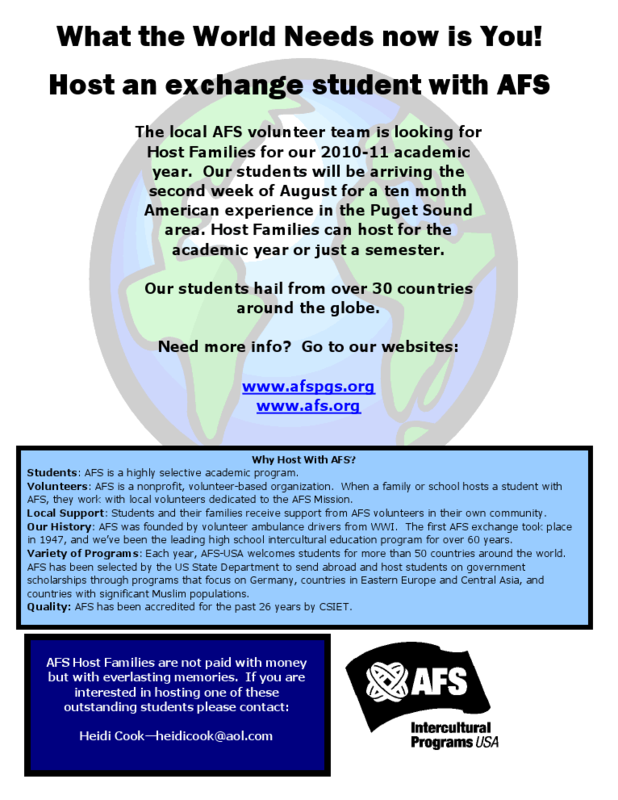 Click on the links above to view the flyers. If you regularly travel through the 1900 block of S Waite you’ll need to find an alternate route for the next few days. There is a sewer main blockage on South Waite Street around halfway between 19th and 20th. Seattle Public Utilities is on the scene working to order to restore service tonight and have closed the street to through traffic. In addition some parking on the street is currently blocked off and will remain so during working hours between 7:00 am and 7:00 pm. They expect to have a more permanent fix in place by Tuesday. The utilities crew will cover the excavation with a metal plate and open the road to traffic during off-hours and will pour a temporary asphalt patch once the fix is complete. They expect the road services crew to come in behind them within a month to delete the four concrete slabs affected by the work and pour some new ones. The Jose Rizal Bridge rehab project is starting soon, and to facilitate this work, traffic on the bridge will be reduced to one lane in each direction for the next four months. A sidewalk on one side of the bridge at a time will be closed, and access for pedestrians and bicycles will be maintained on the opposite side. There will also be periodic lane closures on South Dearborn Street under the bridge. Photo courtesy of Seattle Municipal Archives. 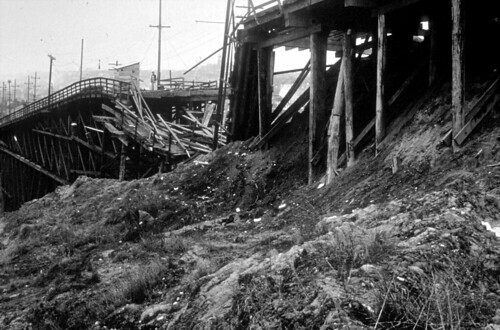 This is probably a photo of the 12th Avenue South Bridge (now Jose Rizal Bridge) in spring 1917, when a mudslide destroyed the southern (wooden) approach to the bridge. The bridge was later repaired. 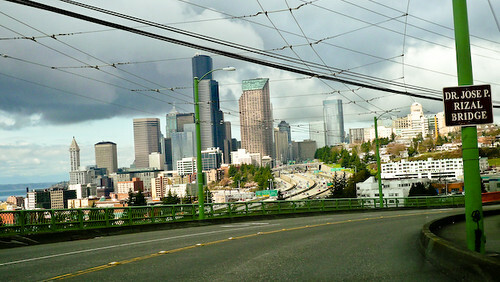 The Jose Rizal bridge was built in 1911, and is the oldest steel-arch bridge in Washington state. This 1912 photo shows the familiar shape of the bridge that many of us cross daily. Getting to West Seattle and Sodo from Beacon Hill is going to get more complicated, starting tonight. As we’ve reported previously, the Fourth Avenue South off-ramp from the West Seattle viaduct will be closing permanently starting at 10:00 pm tonight, eventually to be replaced by a new off-ramp at First Avenue South. Spokane Street (at surface level) will be closed from First to Sixth avenues, though business access will be preserved. The eastbound lanes will reopen sometime in 2010, and the westbound lanes will be closed for the duration of the project. In more short-term closures, the northbound I-5 ramp to the West Seattle Bridge will close at 10:00 pm tonight and reopen at 5:00 am on Monday. The ramp from westbound Columbian Way to the West Seattle Bridge will also be closed for the entire weekend. Fourth Avenue South will be closed entirely between South Horton Street and Industrial Way South from 10:00 tonight until 5:00 am tomorrow morning, with possible further restrictions as needed, and the same stretch of road will be reduced to one lane in each direction for at least a month after that. This may include full closure of northbound lanes at night. Expect detours and congestion both on I-5 and in the Sodo area over the weekend. See maps and further info here, and more about the project here. Columbian Way South (and part of South Alaska Street) is closed between Beacon Avenue South and Martin Luther King Jr. Way South, due to a tree that fell and took some power lines with it in the 2500 block at 1:27 am. It’s expected to be closed until at least 8:30 this morning. Power was out for about 3,000 folks on Beacon Hill and elsewhere in Southeast Seattle, including the VA Hospital. Power has since been restored to all but about 300 City Light customers, and the current expectation is that the power will be fully restored by noon. Here at the BHB, we noticed two power flickers at the time of the outage, but power stayed on in our part of the Hill. According to City Light, the area now affected is bordered on the north by South Hinds Street, on the south by South Ferdinand Street, between 4th Avenue South and Martin Luther King Jr. Way South. This is the approximate location of the downed wires and tree on Columbian Way South. Starting as soon as Monday, June 15 , 17th Avenue South will be closed at the intersection of South Lander Street for repaving. The closure will remain in place for 24 hours a day/7 days a week, and is anticipated to last for approximately 10-14 days. Local access will be maintained at all times and all sidewalks will remain open. Flaggers will be available on site to allow local traffic through the work zone. Right on S. McClellan Street to return to 17th Ave S.
Left on S. McClellan Street to return to 17th Ave S.